At least one person was airlifted to the hospital with serious injuries after multiple semi-trucks and a pickup collided on southbound Interstate 5 in Chehalis on Tuesday morning. Washington State Patrol said the crash occurred at 4:15 a.m. at La Bree Road. The incident blocked all lanes of southbound I-5. State Patrol said two semi-trucks and a pickup were involved in the crash. Troopers said the pickup truck rolled over and then caught fire. The driver of the pickup was airlifted to Harborview Medical Center in Seattle with a head injury. Photos from the scene of the collision show the jersey barrier pushed into the northbound lanes by the force of the crash. The circumstances leading up to the crash are under investigation. 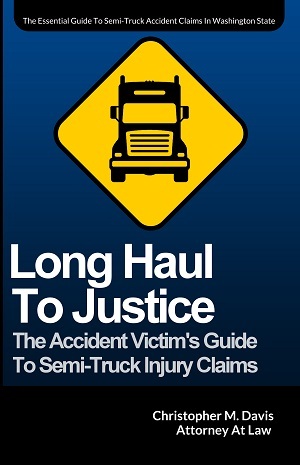 As is often the case with accidents involving semi-trucks – also known as big rigs, 18-wheelers, etc. – the injuries suffered by those involved are often serious or fatal. Part of the reason this occurs is because of the size of semi-trucks. Some semis can weigh up to 40 tons, while the average car or truck weighs just 5,000 pounds. Serious injuries after any accident can complicate the legal case. The victim and their family may not be able to determine all of the losses in the immediate aftermath of the crash. Commercial insurance policies, serious injuries and the complex nature of these cases makes hiring an experienced semi-truck accident lawyer a good decision. READ: How Much Does It Cost To Hire A Semi-Truck Accident Lawyer? Determine liability: This is very different from establishing fault in your typical car accident. Determining liability in a commercial vehicle accident often means multiple parties share some fault – the driver, the trucking company, the manufacturer, the maintenance company, etc. This greatly complicates the investigation and legal case. The right attorney can help you navigate these steps and help get you the compensation you deserve. Negotiate on your behalf: The right truck accident lawyer should have the resources – both financial and skills-wise – to win the case against the trucking company and its aggressive team of defense lawyers. As stated above, there are likely multiple parties involved in a trucking case. Showing a willingness to go to trial and win, or negotiating with multiple parties is important. Know trucking laws: Trucking companies must abide by strict federal and state regulations. While you may be unaware of these laws, your trucking accident lawyer should be well versed and knowledgeable on any potential laws. Not every personal injury lawyer is equipped to handle a trucking case – go with someone who has successfully won millions of dollars for their clients. READ: How Do I Find The Right Semi-Truck Accident Attorney? Attorney Chris Davis – founder of Seattle-based Davis Law Group, P.S. – has in-depth knowledge of trucking laws in Washington State and the various challenges that may apply to these types of cases. Mr. Davis is the premier trucking accident lawyer in the state. If you or a loved one has been injured in a trucking accident, contact us for a free case evaluation to determine your legal rights. Call (206) 727-4000, use the chat feature below or fill out the form on this page to get started.